This is the first article I ever wrote which is a poignant look back at my top picks for games that were never released. I know it made some people cry. Understandably, the quality of the writing wasn’t that good at the time and I did improve it a lot over the years – for instance, now I know how to handle punctuation properly. First published on Just Adventure+ in November 27, 2002. We adventurers are the underdogs of the gaming community. Too many times we have seen our favorite titles delayed, released in a poor and buggy state or even cancelled, which is the focus of this article. With nowadays gaming trends, developers have almost unlimited resources at hand and it’s more profitable to make a cheap action game bursting with eye candy, knowing beforehand that it will be a bestseller or, at the very least, have relatively big market success. In other words: creative minds need not apply and, of course, creativity isn’t cheap. Designing adventure games is no easy task, but that’s another story. The games we’re going to discuss here were cancelled for many different reasons but they all have something in common: someone decided that the project was no longer feasible. Obviously, there have been a lot of excellent games that never saw daylight, but these are the ones that were the most anticipated. Even worse, most held promise that they were going to be great and innovative. Try not shedding a tear. 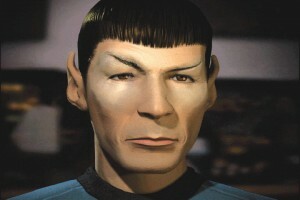 It is still beyond all logic (Vulcan logic that is) why Interplay cancelled this game. 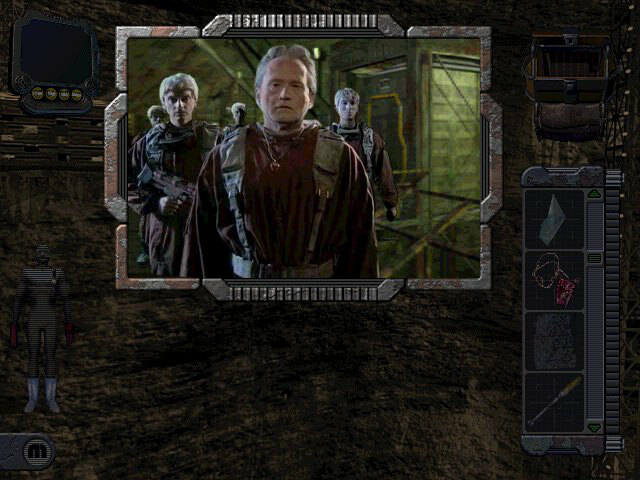 Star Trek: 25th Anniversary and The Judgment Rites were arguably the best games based on the popular series and both of them were modest hits. For this third chapter, the designers had made a job beyond comparison with the incredibly realistic characters modeled after the real actors whom also provided their voices (also present in the two first chapters). 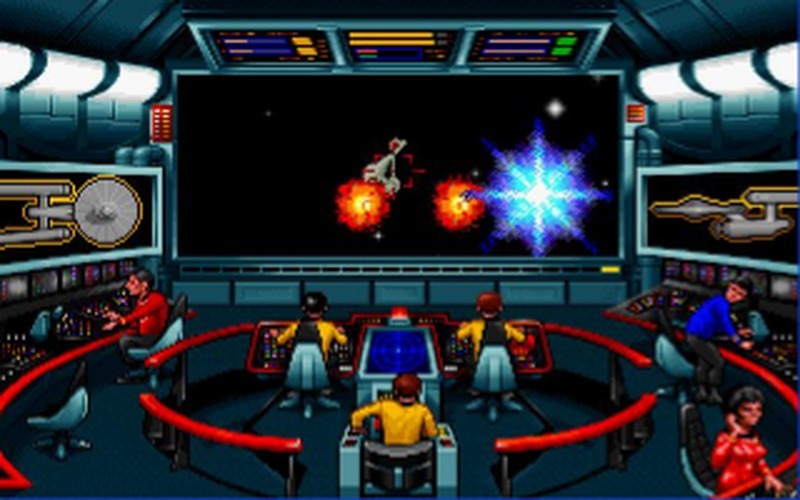 The graphics were the best ever seen in an adventure game up to that date and there was even more promise with a truly epic story directed by John-Meredith Lucas from the original series. It was also written by one of the original scriptwriters, D.C. Fontana: when a Romulan ambassador is found murdered on board the Enterprise on his way to Vulcan during a diplomatic mission of reunification, the Enterprise crew must set things right as this mission is seemingly endangered. Apparent connections to an ancient Vulcan weapon called “Vulcan Fury” makes the mystery even more compelling. The game was divided into six chapters, each one starring a different member of the crew: Captain Kirk, Spock, McCoy, Sulu, Chekov and Scotty. There was no doubt that this was going to be a great game. And then, when it was almost finished, Interplay inexplicably canceled it. It’s not very clear why – although it was probably due to the greater success of their action games line based on the Star Trek universe. Be that as it may, they still have a whole legion of fans dying in agony. 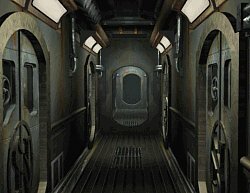 2009 Update: A few years later, an impressive website collecting the history behind this game (which sadly seems to have disappeared) emerged with tons of graphics and information. It certainly reinforced the notion that Vulcan Fury was going to be one hell of an epic title. Between canceling this and Fallout 3 (aka Van Buren) the Interplay execs certainly deserve some major pain. There’s nothing worse than an incomplete trilogy. The adventures of Jérôme Lange began with Mortville Manor and continued with Maupiti Island. The later has become one of the most unjustly forgotten adventure games and some great innovations it introduced to the genre at the time were overlooked at the time. First, it took place in a “pseudo real-time” gameworld (predating titles such as The Last Express and Blade Runner by several years) where events occurred around the player even if he stood still. The characters had their own agenda as well and changed their attitude according to how they were treated. 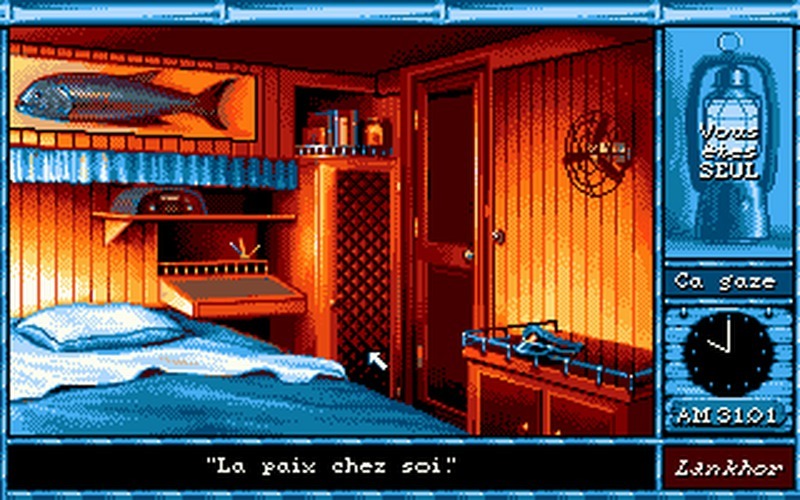 It also had an excellent interrogation system and the gripping plot was very well written: due to a storm, the boat in which Jérôme was traveling must stop at Maupiti island for repairs. As pretty as the island seems to be, dark secrets begin to emerge and Jérôme is asked to investigate the disappearance of the daughter of Maguy, one of the island natives. As the story progresses, it seems that the arrival of the boat to the island wasn’t random at all. All of this made Maupiti Island a truly atmospheric game. 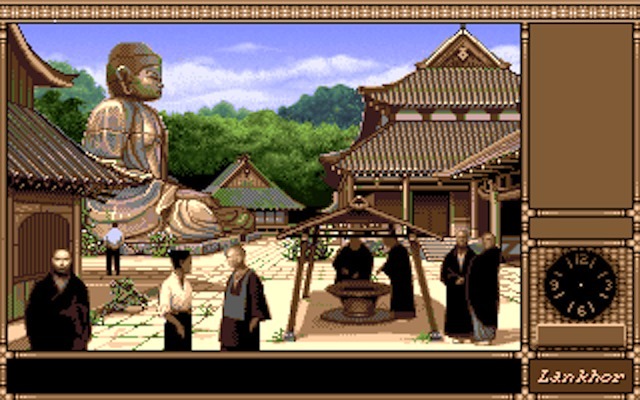 Sukiya was kind of going to continue the story: after finishing the investigation at Maupiti Island, Jérôme is invited by a friend, Max, to spend a few days in Japan in a great Buddha monastery for a well deserved rest. At first, everything seems peaceful and calm in the monastery, similarly to Maupiti Island, until the uncle of Max is found assassinated one morning. Now, it’s up to Jérôme to discover the identity of the killer and find out what is really going on under the peaceful look of the monastery. Sukiya was canceled for the following reason: taking advantage of the modest success Maupiti Island had in Europe, Lankhor made a very uninspired adventure game with the same engine — Black Sect — and it was a total failure in the market. Because of this, the company decided to not continue with the development of Sukiya. The game was almost in a beta testing stage. 2009 Update: Actually, Black Sect wasn’t that bad, it just didn’t do well in the market. I should also point out that it seems like it was a remake of an already existing CPC game. The single Lankhor website left, which had become sort of semi-official, www.lankhor.net has gathered a huge deal of information about Sukiya, including actual assets from the game. Rumors of resurrecting the title a few years ago ended in nothing. Overall, this one really did hurt. The Golden Age of RPG’s was circa 1988. Excellent titles based on AD&D filled the shelves but one stood out from the rest: Wasteland. It provided a 180 degrees turn from other fantasy RPG games by taking the storyline to a post-apocalyptic future. The merely functional graphics didn’t turn away a lot of people who were captivated by this game for months. The innovations it contributed to the genre are countless but, in particular, the character creation system was copied in many other games. It is to this day one of the most respected RPG games ever. It would be a full ten years before a spiritual sequel was released: Fallout. But the real sequel, and a very promising one, got lost in time. Meantime became a kind of a myth among Wasteland fans. There was lots of speculation about how the story would continue, what new ideas it would present, the new engine, etc. But the popular consensus was that Meantime was going to be a great game – a great game that no one would ever see. Over the course of the years, small glimpses of the Meantime premise were revealed: it would involve time travel and some exciting figures could join the party such as Cyrano de Bergerac, Werner von Braun and, very possibly, Albert Einstein. This party would then fix glitches found through History caused by other historical bad guys. 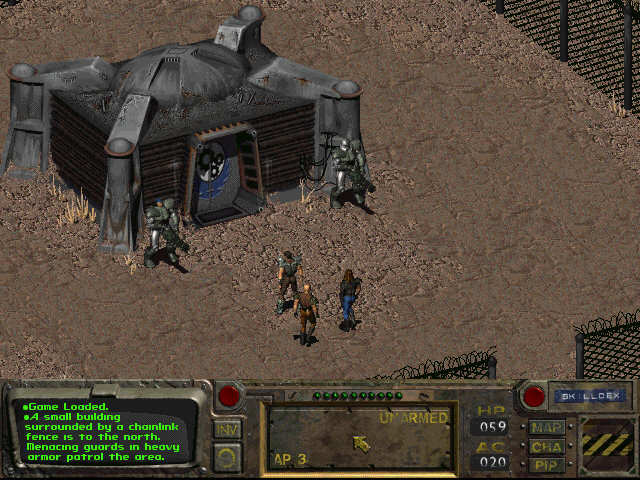 After the project was discontinued, Electronic Arts, who owned the rights to Wasteland, released a semi-official sequel making use of the same engine by the name of Fountain Of Dreams. It was a complete fiasco. Why was Meantime cancelled? It was being developed for Apple II and a beta was in progress when the 8-bit game market started to decline rapidly. The official excuse was that there weren’t enough resources to port the game to DOS. This is actually the only information available for this game and no screenshots exist. We’ll probably never know anything else. 2009 Update: Shortly after this article was finished, some crucial information regarding Meantime emerged, more precisely in the form of the famed “Fallout bibles“. It turns out that Meantime was not going to be a sequel to Wasteland but an entirely new game. Still, the premise was enough to make RPG fans all over the world salivate in anticipation. 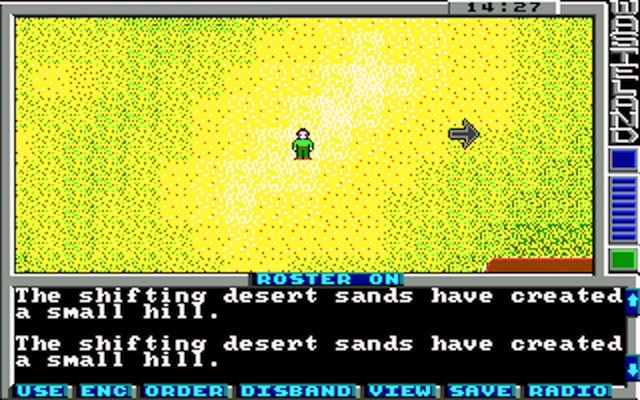 Also, it was revealed that there was, in fact, an attempt to resurrect the development by the time Ultima VII was about to be unleashed into the RPG market – needless to say, the dated Wasteland engine didn’t stand a chance at the technological prowess of Ultima VII (which to this day still manages to impress). And so, Meantime was once again shelved into oblivion. LSL4 was done with its beta stage when the US government confiscated the disks since previous chapters had caused rowdy behavior among key public figur– no wait, that’s not entirely true. Actually, there are more theories surrounding LSL4 than there are about the true identity of Jack The Ripper. The truth is that Al Lowe was so tired after LSL3 that he said there wasn’t going to be a LSL4. And he meant it! Eventually the series was continued, but with Leisure Suit Larry 5. 2009 Update: While Al still hasn’t revealed upfront why the hell there is no LSL4, it has become a toss between a simple market gimmick or his dog eating the master disks. I’ll stick to the dog theory. Sometimes, a game isn’t cancelled because of whims of the market but the sheer incompetence of some people. 20,000 Leagues Under The Sea wasn’t an adaptation of the Jules Verne’s book per se – instead, it would take place many years later: hunger in the world has become a major problem so research teams are studying sites on the sea floor for potential undersea farming. One of these groups stumbles upon what seems to be the long lost captain Nemo’s vessel: the Nautilus. Suddenly, they become stuck in it as they end being chased by pirates interested in some very valuable technology contained onboard. 20,000 Leagues Under The Sea was designed and written by critically acclaimed Lee Sheldon, who was the mastermind behind the classic The Riddle Of Master Lu, and was actively involved in productions of Temüjin and Dark Side Of The Moon, both also from Southpeak Interactive. It would make use of Southpeak’s proprietary engine, Virtual Reality, mixing real actors with rendered scenes. Beginning as a Sanctuary Woods project, Lee putted a lot of effort into 20,000 Leagues devising a fascinating storyline filled with terrifying monsters, secrets and complicated puzzles. When Sanctuary Woods went out of business, Lee offered the design to Southpeak to begin its development. This was probably going to be Lee’s masterpiece but, sadly, all his efforts were torn apart by Southpeak. It seems that the original design was completely rewritten and Lee’s vision of his game was turned upside down. At the end, the final product was in a very poor state and impossible to market. After this episode, Lee left Southpeak and has not worked on adventure games ever since. There were rumors that another company was interested in picking up the scrapped project and turning it into a marketable game, but it was in such a shambles that it would have been like starting a new production and was not financially feasible. 2009 Update: Fortunately, Lee Sheldon returned to adventures with the Agatha Christie series from Dreamcatcher Games. As for Southpeak Interactive: we still hate you. There was huge rejoice among adventure fans when they heard the news that the next installment of acclaimed Warcraft series was to be an adventure game. Could it be? Was the adventure genre going to win a battle against the ever popular RTS genre? No, it wasn’t. The Wacraft series had become very renowned by then, and still is to this day considered to be some of the best RTS games ever released, but Blizzard wanted to tell a story of this universe in a different way – and they chosen the best way to tell it: an adventure game. As the developers were die-hard adventures fans, Warcraft Adventures was designed as a pure traditional, point-n-click adventure with a compelling story and characters. 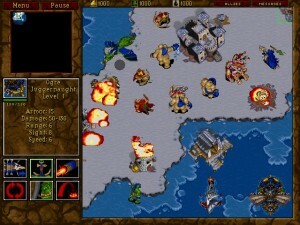 At first, it seemed a bit odd that a firm that usually specialized in RTS suddenly tried their luck at another genre, and fans were certainly reluctant but, as the development slowly progressed, the looks of this new Blizzard game made several gamers drool in anxiety. The story would start where Warcraft II ended: after the Human victory in the long battle against the Orcs, the portal that was the passageway between Azeroth (the Human world) and Draenor (the Orc world) is permanently shut leaving several Orcs stranded in Azeroth. One of these Orcs, Thrall, learns over the course of the game that his race has been enslaved by the humans and he must free them in order to reunite the clan so the Orcs may have a worthy life. The scope of Warcraft Adventures was truly epic and it was the high quality demanded by Blizzard that lead to its demise. Although it was announced later than Warcraft Adventures, the Curse Of Monkey Island was already looking much better than Blizzard’s project. Since there weren’t many other mainstream adventure games at the moment, Curse Of Monkey Island was the direct competitor of Warcraft Adventures and looked, simply put, quite more polished than the latter. The designers felt that their masterpiece didn’t have the quality they expected and it would pale in comparison to the new adventures of Guybrush, so they begrudgingly stopped development. 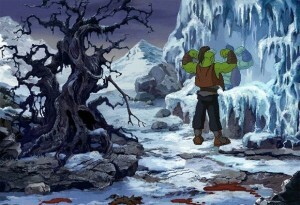 Warcraft Adventures was nearly finished; only some new puzzles and areas were needed for completion. 2009 Update: Not much else has been learnt about Warcraft Adventures since then, but one has to wonder whether it could have helped lessen the agony of the adventure genre over the past decade. It was, after all, going to be an important title from a widely respected game company. If Blizzard indeed cancelled Warcraft Adventures because of Curse Of Monkey Island, I can only say that, in retrospective, it was a pretty dumb thing to do. I can clearly remember how desperately we were craving for adventure titles at the time. These games are just a few among a plethora of unfinished adventures, to name a few: Dark Crystal, Leisure Suit Larry 8, Planetfall (the remake), Space Quest 7 and the list goes on and on. You might be asking yourself by now “Why the heck did I read this? It’s too depressing!”, but you can use this to your advantage: most of the cancelled games named here were either sequels or they aimed to continue a style or idea, and in all cases were preceded by great titles that have yet to be played by a new generation of gamers. So, as you can see, this article wasn’t that useless after all. Grab one of those old titles, enjoy it and you’ll have a glimpse of what could have been. Now, let’s have a moment of silence. 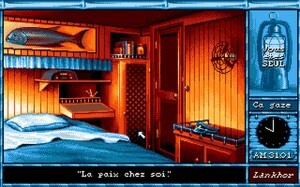 My second favorite adventure game of all times! I loved the first three parts of LSL, the next few were okay I guess, but not as good. And yeah, LSL3 was perhaps the best of them all, and Al knew that, hence the reluctance to go with part 4. I mean, the intro quiz to prove you’re adult in LSL3 (don’t remember if others had it) was a game in itself. And I don’t even wanna touch the travesty that is recent two LSL sequels featuring Larry’s nephew. But hey, no Al Lowe, no Larry Laffer! (insert non-pg13-rated-curse aimed at Sierra here). Right, don’t get me started with the nephew either. That made feel like seriously murdering someone. LSL3 is quite possibly the very best Larry, certainly the raunchiest and game-wise the best designed. As for the funniest, I would claim that LSL7 takes that prize. Actually, the only poor one was the fifth one, but as far as quality and consistency go, Larry was the best Sierra series. An excellent write-up! And I must admit I’m more intrigued than depressed. After all lost games have been known to eventually resurface in some form or another (the Games that Weren’t websites are filled with them), and I’m pretty sure the homebrew community can easily join assets and design docs into playable wholes. Absolutely, we can only hope these will resurrect some day. Vulcan Fury was just about to be completed and many assets were posted on a website (that unfortunately disappeared). It’s same with Sukiya, although many of its assets are still available. I guess they did kill off alot of great games but the console gaming world seems to rule the gaming market these days, nothing wrong with playing on PC, i use to be a PC gamer myself, They have great titles now such as Mass Effect 1 & 2, and Fallout 3, they all rule! And yes i know these titles are on PC as well. Of course PC gamers have the MMO’s these days, that seems to be the big BOOM for pc gaming, i was able to get back into those for a short period but was not impressed since SWG quite a few years back.